Instrumento innovador combinado con un rendimiento de alta gama para la verificación de instalaciones eléctricas según los estándares VDE 0100. Realiza todas las pruebas de seguridad importantes para la verificación inicial de nuevas plantas o anual, RCD, voltaje, lazo, baja resistencia, resistencia de tierra, aislamiento. Equipado con una gran pantalla TFT a color de 3.5 ". Los valores de medición se pueden almacenar en un teléfono móvil con una aplicación ( iOS / Android) vía Bluetooth, o en una memoria SD, o vía USB en una PC. El instrumento está equipado con todos los accesorios necesarios, todos los cables y software en CD. La aplicación para teléfonos móviles puede ser descargado del sitio web. This innovative combined meter for testing electrical installations according to VDE 0100 convinces by its technical performance in the high-end range. With the large 3.5 "TFT color display all important safety checks as the RCD, Voltage, Loop, Low-Ohm, Earth resistance and Insulation tests for annual safety-checks and newly installed systems can safely be carried out by the responsible electrical engineer. Since this new development was designed only according to the latest standards, the required measuring values can be even more conveniently stored with an App (iOS / Android) via Bluetooth on the mobile phone, saved to a SD card or, when work is completed, from the internal data memory via USB connection to a PC. Of course, the device is already equipped with an extensive range of accessories, all required test leads and any necessary software CD. An App for mobile phones can be downloaded additonally. The built-in help function can display each measurement function with a connection-sketch, how a test must be carried out. 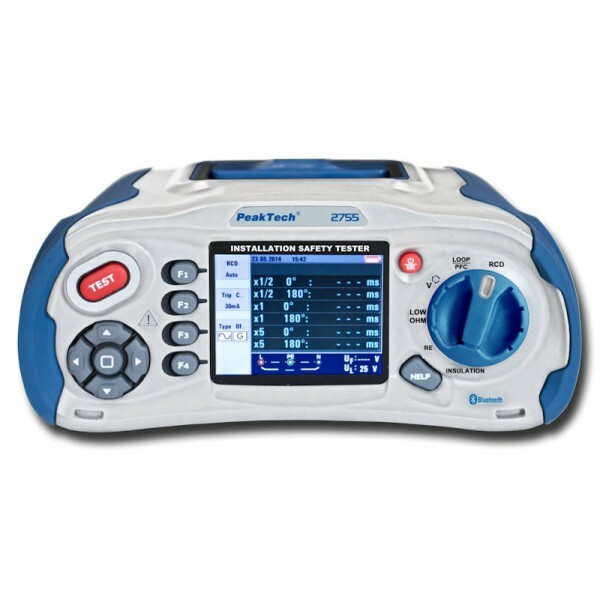 Trough this and the graphical user interface, the device is easy to handle and applicable for all qualified electric personnel, technicians and engineers. To ensure a daily use, this device is powered by standard rechargeable Ni-Mh batteries, which can be charged in the device. Additional charged batteries can be carried with the instrument to always ensure the applicability or to extend the already high average operating time of 15 hours, even during longer missions. Also this device can be recharged from the mains or by a 12V car adapter. During use, this high quality unit is protected by its IP 65 protection rating against dust, jets of water on all sides and can be transported in the included carrying case safely. During the measurement process it can also safely be held comfortably with a carrying strap.